Microsoft had introduced Windows 10 OS on 29th of July this year (2015) and it has taken 4 months to launch the first set of handsets running this operating system. Yes, that’s right! The new Microsoft phones (the Lumia 950 and its XL variant) have been finally unveiled after a long gap of almost 2 years. Microsoft seems to be in no hurry to sell these phones as Lumia 950 XL and its sibling is scheduled to be launched worldwide in November. These 2 phones are different from each other. 950 XL includes the 64 bit Qualcomm octa-core Snapdragon 810 processor. It has 5.70 inches quad HD screen which is based on OLED technology. Adreno 430 graphics system in this handset will be supported very well by the screen. The picture and video clarity will be amazing because the pixel density is well over 550. Microsoft corporation has placed a 3340 mAh battery in Lumia 950XL. It has also used fast charging technology so that device can be charged up to 50% within 1800 seconds. When launched, XL will carry a 650 dollars price tag i.e within 42000 to 43000 Rs in India. Microsoft Lumia 950 on other hand employs hexacore i.e 6 core Snapdragon 808 CPU. The display of this latest Windows 10 phone is 0.5 inches smaller if you compare it with Microsoft Lumia 950 XL. A 3000 mAh battery powers the device. Lumia 950 will cost you under 35000 Rs i.e around 540 dollars. Google Nexus 6P is also priced in the same range. You should have a look at its amazing features. High-end phones are usually equipped with high-resolution cameras capable of recording 4k, slow motion, and 2K content. Microsoft Lumia 950 XL and 950 won’t disappoint you as they both support OIS technology (optical image stabilization) and they feature 20.2 million pixel rear, 5 million pixel front cameras along with a triple LED flash module. The rear sensor will capture amazing selfies as it includes a large wide-angle lens. The touchscreen comes with Corning gorilla 4 glass layer. The smartphones support cool new Windows 10 phone features like Continuum, Windows hello, etc. It will have a digital assistant in the form of Microsoft Cortana. The DA is connected with Bing search engine. Windows Hello will use the phone’s IRIS scanner to detect its owner or authorized user. 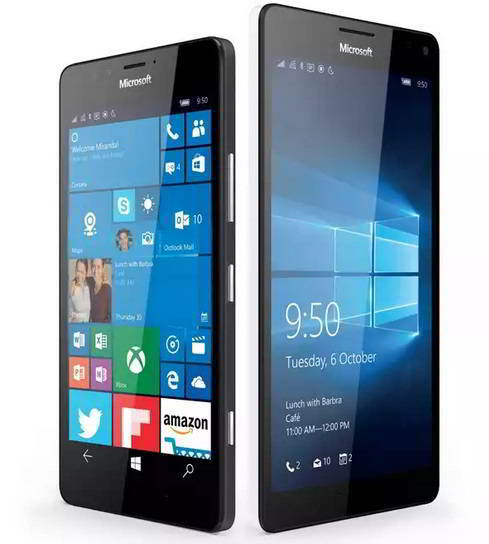 Microsoft Lumia 950 ad XL version pack with microSD slot (which support 200GB cards), 3GB RAM and 32 GB internal storage. The user might also get free online cloud storage space on OneDrive platform. The surface of smartphones usually gets heated when you use it for several continuous minutes. Microsoft has used liquid cooling technology to keep the powerful CPUs and graphics chip in its 2 devices cool. Liquid cooling systems are usually found in powerful gaming computers with 8+ GB RAM, powerful Intel core I7 CPUs and they work great. The latest version of Android is officially made available for other manufacturers immediately after Google launches a new phone or a tablet. For example, Android 6.0 i.e Marshmallow was launched after Google introduced Nexus 6P handset and Pixel C tablet. Microsoft might employ the same strategy. Once the 2 Lumia phones are made available for your purchase, Nokia, Microsoft and other devices will get Windows 10 update. Important details of Lumia 950 XL phone were leaked immediately after the launch of Win 10 OS and since then, a lot of rumors were published on leading tech blogs and news sites. If you compare the leaked details with the above specs, you will conclude that most of the rumors were indeed correct. Pramod is a computer programmer and an Android, Linux OS user. He enjoys reading books and watching thriller, mystery movies. I’m addicted to Windows phones. I’m currently using of the Lumias but reading this Lumia 950, one obviously needs to change his phone. wow! Its really cool but the price tag accompanying it is quite exorbitant!